At FCAR, we keep our administrative costs low and the benefits for animals high. Our work would not be possible without the generous financial support of caring people like you. Your donation will go to work instantly to help feed and heal hundreds of animals at our shelter. Whether you are a longtime supporter or you are donating for the first time, thank you for helping us to carry on this worthy mission. Payroll Deduction through your employer with United Way. Our EIN is 62-1836008. Are you an American Express® Card holder? Click the banner below to use your American Express Card to make a donation. If you are enrolled in an American Express Loyalty program, you can earn valuable rewards with virtually every dollar you donate. iGive.com: Raise money for FCAR while you shop! Add the Fayette County Animal Rescue toolbar to IE or Firefox. 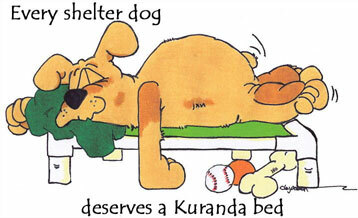 Donate a Kuranda Bed, these are indestructible beds perfect for our shelter. Click here to order a bed for Fayette County Animal Rescue. Being a Corporate Sponsor for FCAR is a great way to help homeless animals. You pick the support level that works for you and It will help us find wonderful homes for needy animals. All supporters receive a quarterly newsletter and notice of all FCAR events. Please send your tax-deductible contributions to FCAR PO Box 44, Rossville, TN 38066. Fayette County Animal Rescue is a nonprofit 501 (C) 3 Corporation. You can make your secure on line donations by clicking the button below. How can you express your support to a friend grieving over a lost pet? Where can money be sent in lieu of flowers when an animal lover has passed away? What can you give as a gift to the person who has everything? Send a memorial or an honorarium! When a memorial or honorarium is made in one’s honor or memory, a card will be sent to the designated person with the donor’s name. This acknowledgment will also be listed in the next FCAR newsletter. Click here to download a donation form..
A bequest to Fayette County Animal Rescue is the simplest and surest way to provide a secure future for animals in need. We will work with you so that your charitable intentions benefit you, your loved ones, and the mission of FCAR. Many people underestimate the true value of their estates or don't consider themselves "wealthy." And sadly, some who give so generously throughout their lives neglect this wonderful opportunity to make a difference. Perhaps by using a "hidden asset" you thought was of little value, we could help you create an enduring legacy. No matter how large or small, every gift is precious to the animals who FCAR protects. Your will truly can make a difference. Thank you! You can donate items by bringing them by our shelter (please call for an appointment), to any of our events and adoptions, or for larger items contact us and we will coordinate picking the items up.